At the Beaufort West Hillside Clinic, smart use of strategically placed rock stores reduce the pressure on the building’s heating and cooling system. The Beaufort West Hillside Clinic makes use of rock stores to reduce the pressure on the artificial heating and cooling system − a requirement in order to reduce energy consumption in the building. Chambers, separated from the intake and outlet plenums by perforated concrete block walls lined with wire mesh, are located below the surface beds in the southwestern and southeastern corners of the building’s individual wings. They’re filled with locally sourced rocks that are mostly spherical in shape and have a diameter of about 100mm. Prior to installation, the rocks were cleaned with water to remove dust and sediment, and the rock stores were capped with polystyrene insulation before the surface beds were cast over them. The rock stores’ positions correspond to the positions of ventilation stacks − which are fairly tall to limit dust intake and keep any intakes away from the hot roof surface − at the apex of the building’s hipped roofs, from where ambient air is mechanically drawn into plenums adjacent to the rock stores. From the intake plenums, the air is drawn through the rock stores. 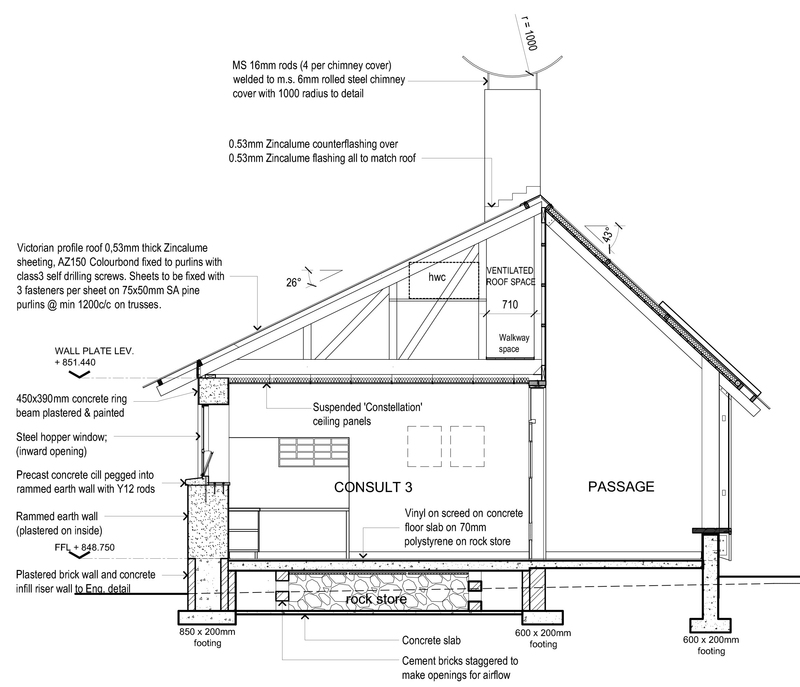 Heat exchange takes place between the air and the rocks before the air flows via an outlet plenum into the ducted mechanical ventilation system. Since cooling requires the most energy, the primary concern was for the pre-cooling of the air before it enters the mechanical ventilation system, which is fitted with temperature sensors that only activate the air-conditioning when it is necessary. Due to the low prevalence of wind in the area and the high number of fresh air changes required for airbourne infection control (six to eight ACH), the air has to be moved mechanically: The fans stay on during the night so that the rocks can be cooled by the night air. As a result, the building’s indoor air temperature is already mediated by the time it opens in the mornings. 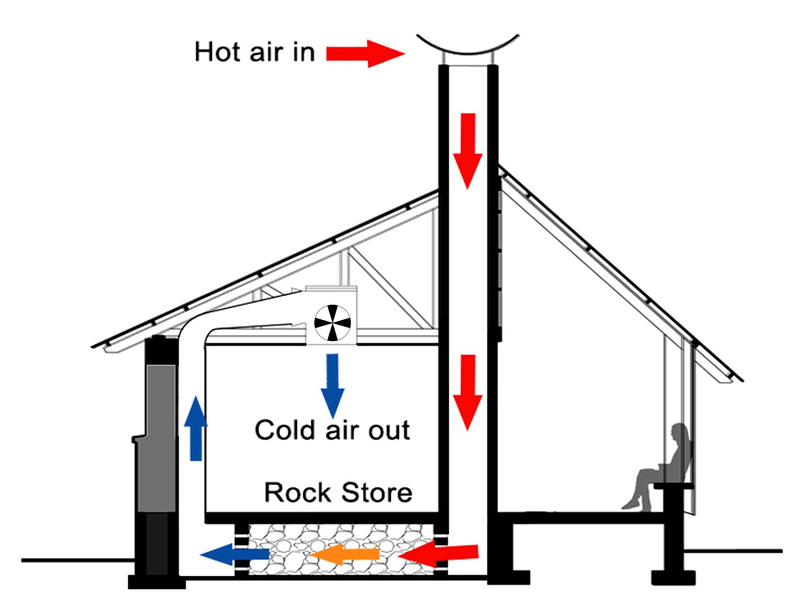 The rock stores reduce the temperature of the outside air in summer, and increase it in the winter, when temperatures can drop to -2°C . Readings show that the rock stores make a difference of up to 10 degrees, which means the electrical consumption of the air-conditioning system is drastically reduced.